Are you getting tired of playing 6 hour shallow games? Splash Damage hears you on that, and promises that Brink will be a truly massive game. The single player experience will keep you busy for quite some time with intense story, character animations that promise to deliver that human feel to the game, and of course co-op with incentives for playing together. Splash Damage's CEO Paul Wedgewood had this to say on the game. "This is a game that has been built from the outset as a heavily narrative-driven story by full-time writers. We’re making use of techniques like performance capturing - so we get really good physical performances from actors along with their facial expressions and voices and their interaction with other actors - to build a game that has a really strong narrative component that isn’t just a highly replayable shooter." 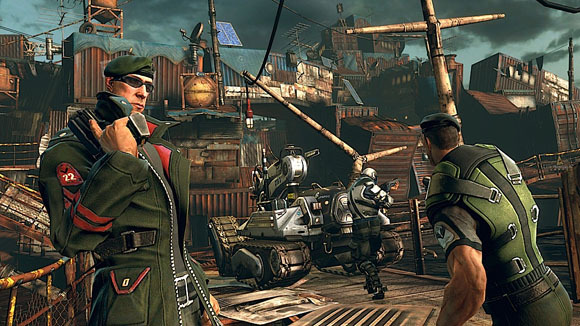 On top of the massive single player campaign, Wedgewood told Joystiq that they were pushing to change peoples minds about co-op. "At a certain point in the game we say to them, 'Why don't you just try co-op and see how you go? For this next mission we're going to give you twice the number of experience points if you play co-operatively with somebody else.'" Not that we need any encouraging here, but it's nice to see a developer really pushing for their co-op to be used without punishing the single player gamer in the process. Check out this video from G4 TV taking a quick look at just how massive this game really is. Which Side of the Brink Will You Stand On?